Qualify for free medical benefits for every purchase of Clearlight Infrared Foot Sauna! 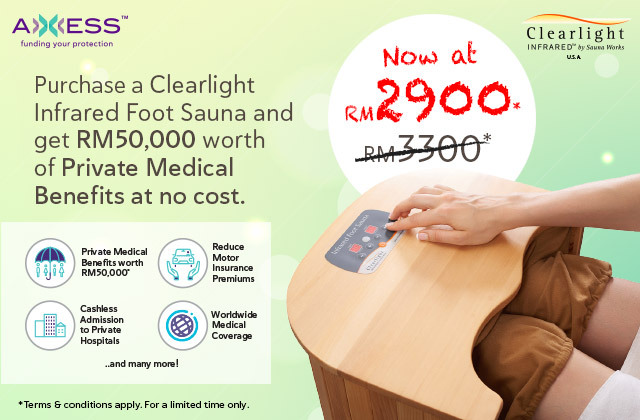 Tell me More : Grab your very own Clearlight Infrared Foot Sauna for only RM2,900! You will also qualify for medical benefits worth RM50,000 at no cost! Don't miss out. Every purchase of the Infrared Foot Sauna entitles you to a free activated AXXESS card and automatically qualifies you for the Private Healthcare Benefit of RM50,000 (at no additional cost). AXXESSPoints given under this promotion are only applicable for the Private Healthcare Benefit and may not appear in your Member Account.